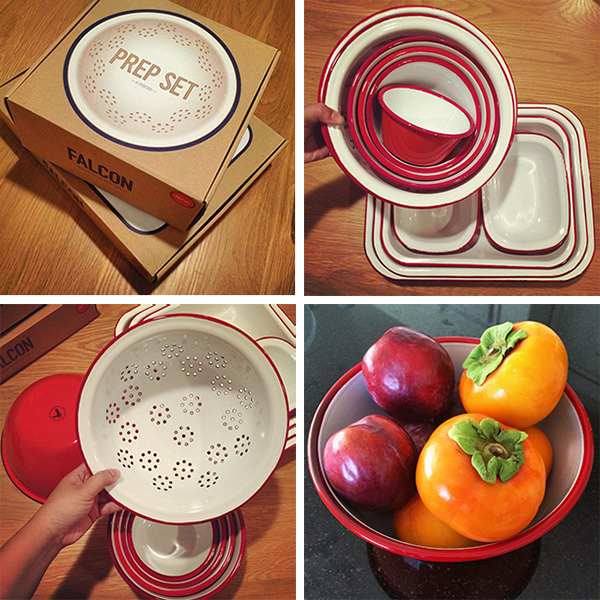 One of the acquisitions kicking this all off - mixing bowls and bakeware needed an upgrade… and the Falcon Enamelware Prep Set and Bake Set are so beautifully packaged and designed (they were also on some ridiculous sale at the time)… and are even lovlier in person! I use them for everything! The colander is the most iconic piece - and the reds just make me happy. Eating more fruits and veggies came with the territory when cutting out the carbs - so the kitchen was instantly more colorful from walks to our local farmer’s market a few blocks away. One late night shopping online lead to trying to figure out what to spend amex points on… I used to just turn them into saks/neimans gift cards for a shopping spree, but that seemed silly. So between our food challenge and the urge to want to buy something… decided kitchen upgrades could work! 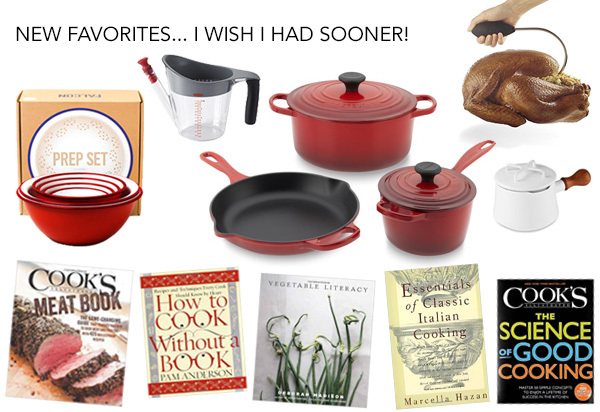 And Williams Sonoma gift cards were an option… and I’ve always been curious about Le Creuset cast iron. Being as heavy and pricey as they are, i’d never considered them an investment i was ready to make, but with the new challenge in place, they somehow seemed like a perfect reason to learn some new recipes and see what a difference they really make. I’ve been a light, nonstick pan girl ever since, so this was all new to me! Fun fact? The cast iron doesn’t need to be seasoned, they have special coatings! So it is already far easier than jumping into a pure cast iron piece. Also i was curious to play with pans that can go right into the oven! 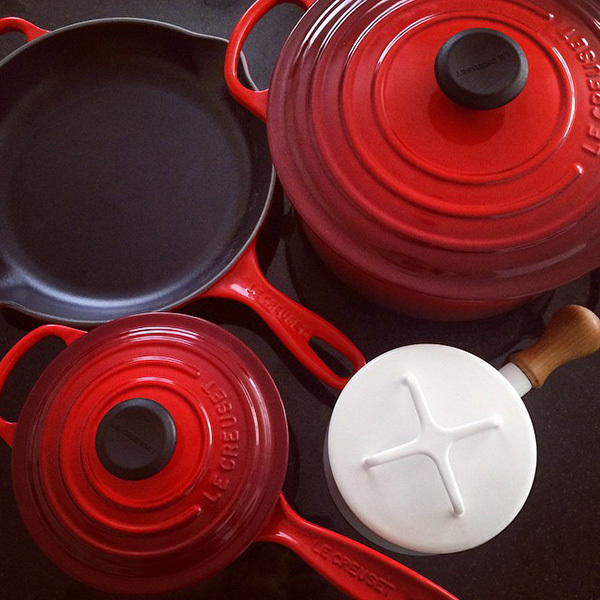 So i cashed in the amex points for this Le Creuset Set… 10” fry pan, 1 1/2-qt. saucepan with lid, and 5 1/2-qt. round dutch oven with lid. I was also debating going Dansk (the trivet lids are SO cute!) but reading up, ultimately like the Le Creuset better, so got a token 1qt Dansk Pot - the smallest size with a lid and wooden handle! Theme for the week - meat! 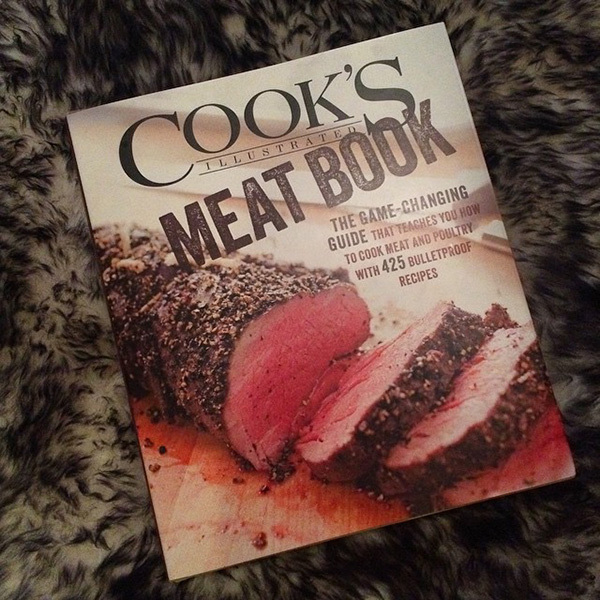 There was so much to learn about - from how to choose different cuts, to brining and searing, to the differences between different animal families and more… i found the Cook’s Illustrated MEAT Book - which is a fantastic resource worth having! 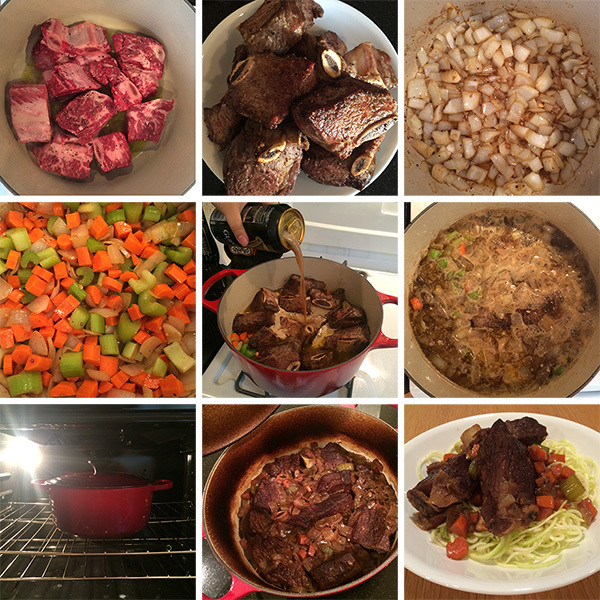 … and the first thing to try in the dutch oven - Guinness Braised Short Ribs! on Zoodles (spiralized zucchini) … so delicious. 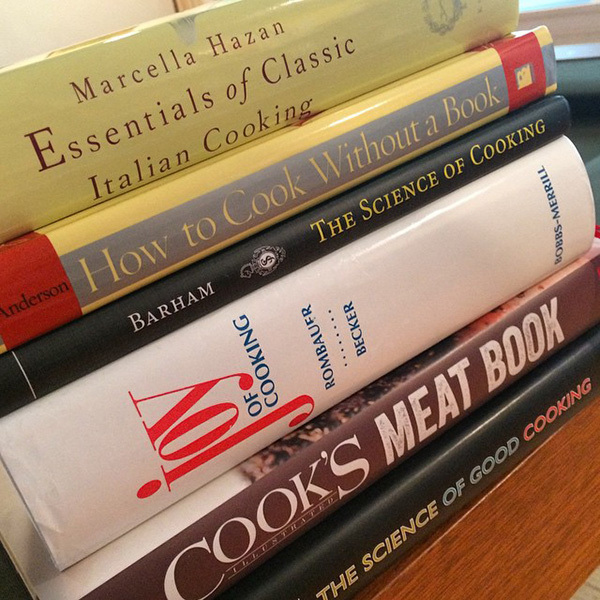 A few more cookbooks got added to the list… my mom lending me her copies of The Science of Cooking and the classic Joy of Cooking… Cook’s Illustrated The Science of Good Cooking is great for a scientific understanding paired with recipe examples. 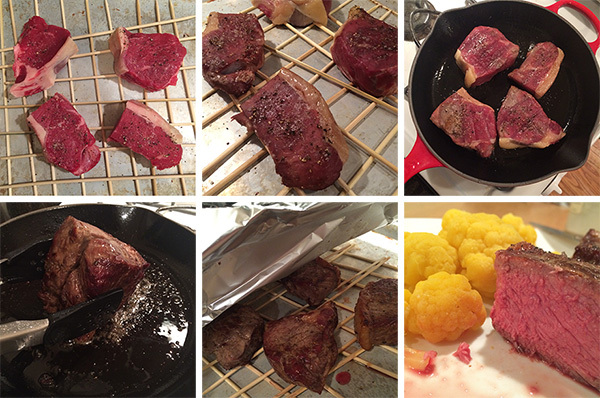 How to Cook Without a Book, i wish i had when i moved into my first apartment in college! Super helpful to start intuiting what can and can’t be substituted and how to improvise basics based on what’s in your fridge. Ooh and Marcella Hazan’s Essentials of Classic Italian Cooking - she’s said to be to Italian cooking what Julia Child is to French cooking, and missing living in Italy, i just had to read it for myself. These have all been fantastic reads on catching up on HOW to think about and approach cooking, ingredients, and even just organizing the kitchen. 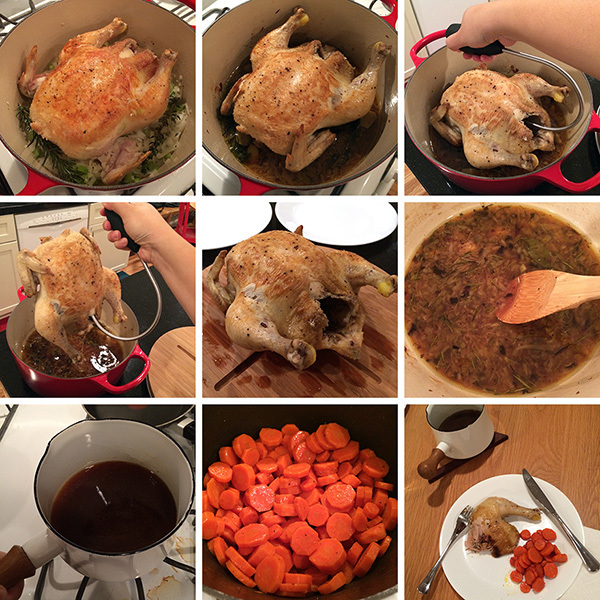 One of our new favorite go-to recipes is now Poulet en Cocotte - literally chicken in a pot! You braise it and let it sit in the oven till it’s ridiculously soft and juicy with the tastiest sauce! Delicious with maple glazed carrots… That Dansk 1qt pot is the perfect gravy pot, and looks great sitting on the table. Though while i love the idea of a lid/trivet, when you’ve just used the lid - putting it on the table both hot and filled with condensation isn’t ideal. Romanesco broccoli! 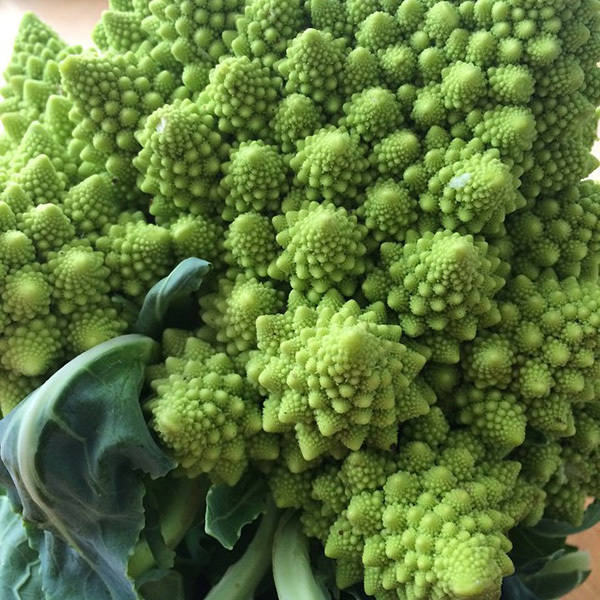 Mmmm edible fractals. Dansk Lid as a Trivet… and some bacon deviled eggs. 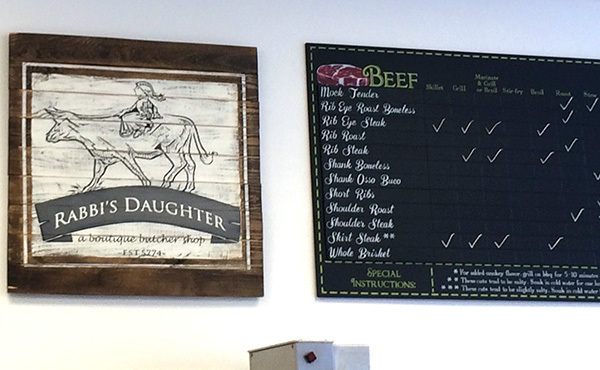 Researching meat, also meant researching butchers! Some were definitely more informed and helpful than others… The Rabbi’s Daughter is great, and even has a chart to help figure out which cuts are best for which styles of cooking. When too tired (or lazy) to heat up the grill, we finally learned about proper ways to get a good sear while maintaining the red color of steak on the stove (pop it in the oven first!) - also had to get creative with bamboo skewers when we didn’t have a metal rack that was oven safe. As we learned more and more about meat - the next phase of research was Vegetables! 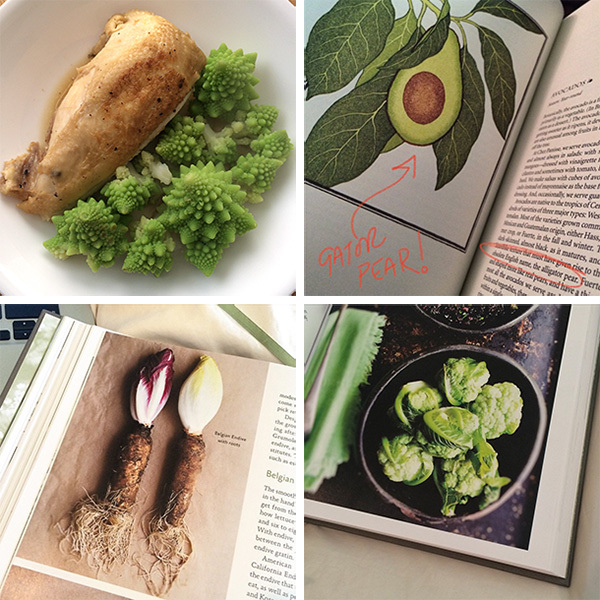 My favorite vegetable resource is Vegetable Literacy - the whole book is broken down by scientific families, filled with gorgeous images, and is incredibly informative on understanding how various vegetables are related to one another and how they are best prepared (and why!) - it also emphasizes the importance and options that open up when you are growing your own! While waiting for that one to arrive, i also read Alice Water’s Chez Panisse Vegetables (turns out my dad had a signed copy?!?!) where i learned that Avocados were once called ALLIGATOR PEARS! How fun is that? It was generally an interesting read, particularly for a California perspective on what is seasonal and when for us… but if i were to pick one for my shelf, it would be Vegetable Literacy. 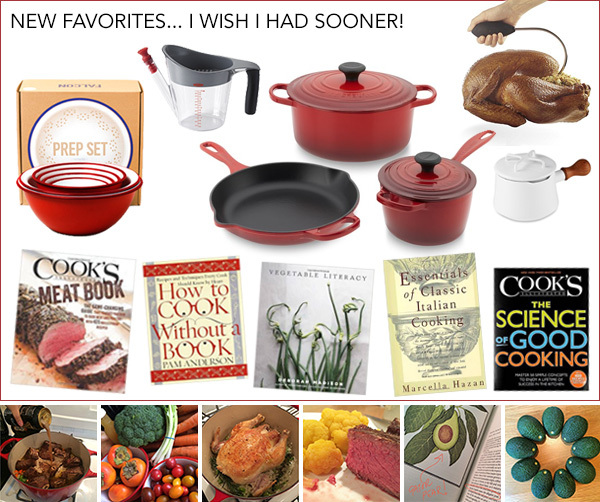 Now as for some of the new things that upgraded my kitchen and library the last month… I highly recommend all of these! 5 - OXO Poultry Lifter - it sounds silly, but i’ve had a few near disasters with very hot, slippery chickens trying to be maneuvered with multiple wooden spoons. 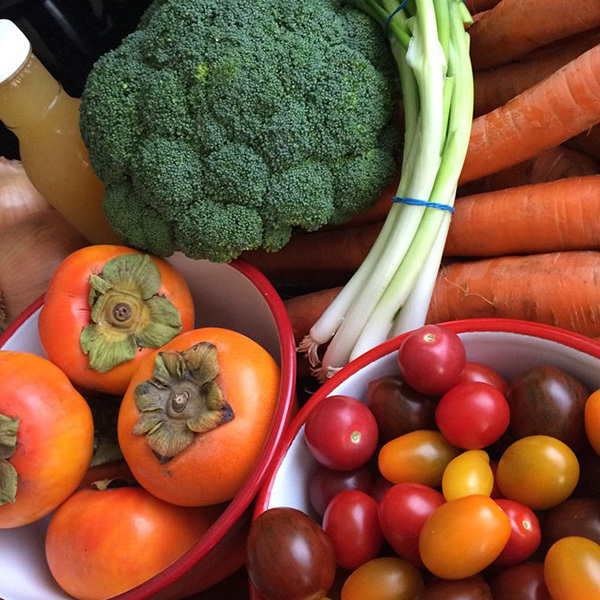 Anyhow - this is all just the beginning of some of our experiments at home to cook fresher, simpler, delicious foods… and of course even Bucky has been loving the increase in cooking and scraps that are dog friendly. Our garden is also flourishing - and our Haas Avocado tree’s first crop has been bountiful - you can see Bucky trying to “help” while i’m up there picking the higher ones. … and as for what’s next? Waiting for delivery of new knives… and possibly a slide in range!